What qualities do you look for in a certified public accounting firm: accountability, credibility, accessibility, a trusted partner? Howe & Company offers all of the above, and more. 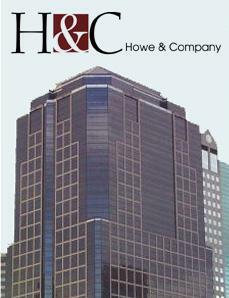 Located in Kansas City´s financial district, Howe & Company has been serving the tax and accounting needs of the middle market for more than 35 years. The firm was built on a foundation of tireless integrity and defined by a passion and commitment to serving our clients. We´re a full-service firm with a particular emphasis on providing tax compliance and planning services to the real estate industry. The Kansas City Business Journal has perennially ranked us as one of the area´s top 25 CPA firms. We´re proud of our firm and our dedicated professionals who possess strong technical tax and accounting skills. While we provide expert services for a wide variety of businesses, trusts, and high net-worth individuals, our core competency has led us to develop an industry specialization in providing tax services to commercial real estate owners and developers. We look forward to serving long-standing and new clients with the same high standards of professionalism and commitment.